In 2046, when the history of the first 50 years of the MLS is published, I have no doubt that Dwayne De Rosario will be highlighted as one of the top players of the league’s first 20 years of existence. After spending time with the Toronto Lynx, FSV Zwickau, and the Richmond Kickers, in 2001 De Rosario was brought to the San Jose Earthquakes by Coach Frankie Yallop, which is not surprising since, with his ties to Canada, Yallop had to be aware of the talent level of this young Canadian of Guyanese descent. In his first year in MLS, De Rosario started 11 games, played in 21 matches, scored 5 goals, and picked up 4 assists, and he was the MVP of the 2001 MLS Cup, which the Quakes won. Over the next few years, De Rosario proved a steady role player for the Quakes, including his recovery from an ACL injury in 2003, but he was always in the shadow of the team’s star player, Landon Donovan. Donovan parted ways with the Quakes after the 2004 MLS season, opening the door for De Rosario to become a leader in San Jose’s midfield. The 2005 season proved to be a stand out year for De Rosario who scored 9 goals and had 13 assists in 28 matches. Despite winning the Supporters Shield in 2005, the Quakes made an early exit from the MLS playoffs and then learned that they were moving to Houston, Texas for the 2006 season. The disappointments of the 2005 season and the move from San Jose to Houston apparently had no impact on De Rosario, who had a better season in 2006 then he did in 2005. With 29 game starts and 30 games played, De Rosario picked up 11 goals and 5 assists in the Dynamo’s inaugural season. Additionally, he not only played the entire All-Star game against Chelsea, but he scored the game winning goal for the US side. Finally, he was integral part of the Houston Dynamo victory over the New England Revolution in the MLS Cup, bringing the City of Houston it’s first championship since the Houston Comets won 4 championships between 1997 and 2000. The 2007 season saw a drop in De Rosario’s stats as he only scored 6 goals and picked up 4 assists. Despite the drop in numbers, De Rosario scored the winning goal for the Dynamo in the 2007 MLS Cup, again beating the Revolution, and become the first MLS player to pick up two MLS Cup MVP honors. The Dynamo’s 2008 season opened with very high expectations, would the Houston franchise become a dynasty by winning three MLS Cups in a row? In the end, De Rosario managed 7 goals and only 2 assists, while the Dynamo were knocked out of the MLS Play-Offs in the first round by Red Bull New York. For 8 seasons, Dwayne De Rosario was an integral part of the San Jose Earthquakes/Houston Dynamo franchise. In that time he picked up 4 MLS Cups and two MLS Cup MVP honors. As recently as this past summer, some commentators stated that De Rosario was the best player in the MLS. And as the 2008 season gave way to the post season, Houston Dynamo fans could sleep well at night knowing that De Rosario was on their team. But then reality set in and the Houston Dynamo announced that they were sending De Rosario back to his homeland to play for Toronto FC, who joined the MLS in 2007. In a sense this was a surprise move, at the end of the 2008 season nobody expected to see De Rosario leave Houston before the 2009 season. But, on the other hand, this was not a surprise move because De Rosario, who grew up in a suburb of Toronto, had expressed a strong interest in playing for Toronto FC. In light of the Dynamo’s lackluster performance against Atlante in the CONCACAF Champions League, there has been some hand wringing and teeth gnashing about whether the Dynamo should have traded De Rosario to Toronto. Not to be contrarian or anything, but it seems to me that the De Rosario trade was the right trade at the right time for the Dynamo. As indicated by the discussion above, it appears that De Rosario may have reached his scoring peak in the MLS. The numbers indicate that De Rosario will be a less then 10 goal per season player for here on out. Despite the leadership skills he brings to the pitch, is it in the Dynamo’s best interest to pay over $300,000.00 a year to a player that scores less then 10 goals a season and has suffered a big drop off in assists? Speaking of De Rosario’s contract, it was set to expire in 2010, so the time was right for the Dynamo to trade De Rosario to Toronto while they could still get some value for him. In the trade, the Dynamo picked up young defender Julius James and some allocation money. James, who seems to have some good skill sets, has had a rough start with the Dynamo, but so did Bobby Boswell who has turned out to be an integral part of the Dynamo defense. More importantly, it appears that the Dynamo are seriously interested in acquiring a designated player, something that could not be achieved with De Rosario’s contract on the books. As discussed here previously, the Dynamo made a serious effort to sign Omar Bravo. While that effort failed, I expect that the Dynamo will move quietly and patiently in their search for a designated player and such a signing will occur before the 2009 season is over. Finally, the trade made sense because the Dynamo sent De Rosario to an Eastern squad that plays on artificial turf. Of all the teams in the MLS, Toronto is a club that the Dynamo do not need to consider a serious threat. Finally, the Dynamo could breathe easy because the heir apparent to De Rosario is Stuart Holden, a native of Scotland who grew up in the Sugar Land suburb of Houston. The transition from the De Rosario era to the non-De Rosario era might not be the smoothest or easiest for the Dynamo. But the Houston Dynamo have shown an ability to ride the waves of change, and it’s unlikely that the departure of De Rosario will have a major impact on the Dynamo’s performance in the 2009 MLS Season. You must be joking or be drinking your own kool aid. letting go the star of your team for so little is laughable. DeRo said that he requested the trade, but why?? more money maybe. the Dynamo could've held out for a better offer other than just cap space and a unproven defender. 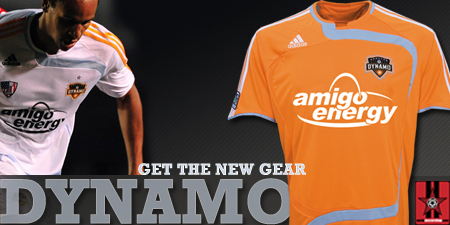 What's done is done but don't think for a minute that the Dynamo came out out of the DeRo trade smelling like a rose.